The Acquire Child Theme by Obox is an official child theme for Layers designed for creating a classic and clean business site or blog. Our child themes are for presentation only – it does not include any special functionality or post types beyond what Layers already provides! Recommended extensions that compliment Acquire are listed below. Below are links to helpful articles to get you going with this child theme. Layers Child Themes provide alternative styling, layouts and enhanced presentation for your Layers website. Unlike a Style Kit, they are packaged into their own theme file that may include preset layouts, templates and additional scripting. Layers Child Themes install and activate just like any WordPress theme, but are dependent on a parent or theme framework to be installed first. In the case of Layers Child Themes, you must have Layers already installed, but it does not need to be activated. 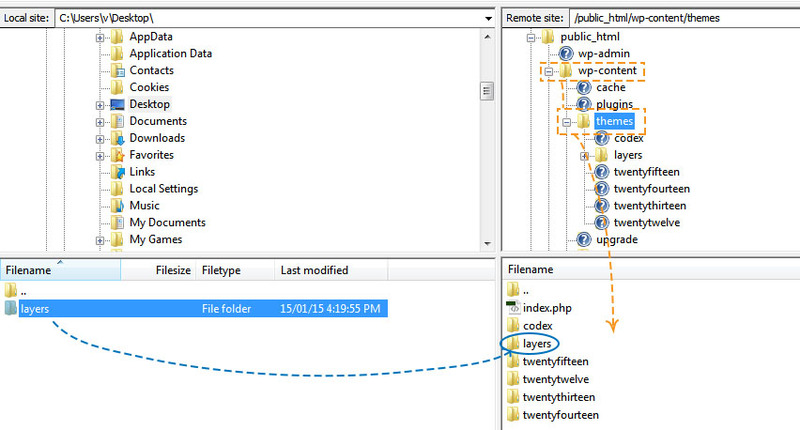 If you downloaded a Layers Child Theme from ThemeForest, be sure to unzip that file to your desktop. The Child Theme’s .zip used to install the theme via WordPress is located inside the themename-package folder. Click the Browse button inside the center white box (Choose File on some browsers)and navigate to the location of your Layers theme zip file. Click Install Now to begin the installation. Wait for the success message, then click the Activate link. You will be directed to the Layers Getting Started screen. Take a minute to go through the wizard and continue with the next article Page Building & Homepages. Unzip the Layers theme zip file to your Desktop (or any easy-to-find location) to find the theme folder, ie "layerswp"
If you are on a Mac and you are seeing extra words or an extension on the folder, open that folder to find the actual layerswp theme folder folder! Drag the theme folder from your computer into the themes directory window. Mac Users: Make sure that the path is wp-content/themes/layerswp/ and not wp-content/themes/layers_package/layerswp or similar as this will cause some functions to break. You will be directed to the Layers Getting Started page. Take a moment to go through the dialog and continue with the next article Page Building & Homepages. after selecting a starting layout. This step is optional if you are not using this theme as an online store. Also check out How to Setup an Online Store with Layers for other great tips! This step is optional, but well worth the time and investment. StoreKit adds additional functionality to Layers such as shop and product customization, product widgets for your builder pages and a header cart, bringing the grand total cost of a site worth more than $1000 to less than a traditional premium theme! Get StoreKit here or View the StoreKit User Guide for detailed help. Layers themes use Presets instead of traditional demo content. You can install these pages under LAYERS → ADD NEW PAGE. The following extensions work great with Acquire and help to expand its functionality to that of full-fledged CMS, but with the benefits of Layers. Jetpack (free) – Adds contact forms, custom post types such as portfolios and testimonials, extra widgets and more. See How to Configure Jetpack for Layers for important tips.